My guest is Scott Oots who lives in Corona, California near Disneyland—it’s a pretty wild, competitive market there. Scott’s been doing this for 5 years. He started by following Sean Terry’s Flip to Freedom program but quickly developed his own system. Scott makes offers with his repeat buyers in mind. He explains his formula clearly here; of course, it varies a bit from market to market. His average wholesale fee is $68,000. Scott educates his buyers and offers them a fair deal; he uses a sound contract that locks buyers in early in the deal process. He does 150 to 160 deals a year. Some people don’t have the stamina for real estate… they get discouraged when the smallest obstacle pops up. Scott gets creative and works around the obstacles as long as the payoff is worth it. Scott uses mail to reach sellers these days. He uses Lead Sherpa to get leads, then mails, texts and calls them. The way Lead Sherpa breaks out lists is ideal for investors. For instance, you can request a list of people age 65+ who live in a 2-story house. Find people’s distress point and let the marketing flow. The bigger the profit, the likelier it is that face-to-face marketing takes place. Scott takes good care of his buyers and finds word-of-mouth marketing works with them. He shares what his marketing budget primarily goes toward. Why Scott’s company is going to expand outside of California this year. How he advises new investors to be with their money. Joe: All right. Hey everybody, welcome. 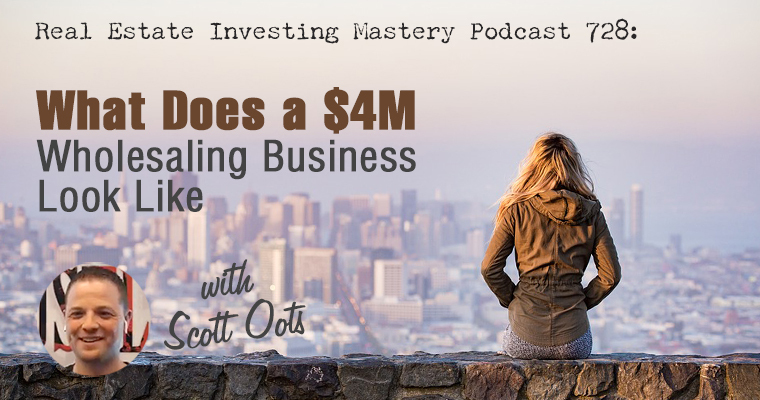 This is The Real Estate Investing Mastery podcast. Got a special guest on the show today. A guy that I heard recommended I’d met Scott before. I’ve heard his name through several different circles that I run in he does a lot of deals. He’s in southern California. His name is Scott Oots and I wanted to get Scott on the show and talk about what he’s doing because a lot of people are talking about him. He’s doing a lot of deals in a very difficult competitive market and I want to bring him on because he seems like a cool guy, right? So I know you’re going to enjoy this we’re going to get a lot out of it. Let me tell you first guys, this podcast is brought to you by my book, Wholesaling Lease Options. The author of this book paid a lot of money in sponsorships to get his book on this show. Joe: Just kidding. This is my book, Wholesaling Lease Options. If you want to learn how to flip lease options, let’s say you’re a wholesaler and you’re getting, doing a lot of marketing, you get a lead that doesn’t have much equity. Well instead of throwing that away, tie that property up as a lease option and flip it to a tenant buyer. And this book talks about how I did that. This is a strategy I use to quit my job back in 2009 and still love lease options today. Rockefeller said, I think it was him. The secret to wealth is to own nothing and control everything and lease options is one of the best ways to do that in this market, in this crazy market. So get the book. If you want it, go to WLOBook.com WLBOook.com and it’s free. Just pay shipping and handling, we’ll ship it out to you. Joe: Okay. So, okay, good. Scott, how you doing man? Scott: I’m great down here. Finally got some good weather in California. It’s been raining for like the last month, so 80 degrees I can’t be complaining at this point, so. Joe: Nice. What part of southern California are you in? Scott: So I’m Corona, which is basically 30 minutes from Disneyland, so it’s kind of how I typically tell people. Joe: Cool. And what is your main market that you focus on? Scott: So we have a pretty wide, the area we go 50 miles out every direction. So we actually work out of five counties. We work San Diego County a little bit, Riverside, Orange, LA and San Bernardino County. So we hit a pretty large, area. LA is a huge place for us, so we do a ton of deals out in the LA area. Joe: Okay, nice. I’m very familiar with that area. I was born in Van Nuys raised in San Diego. I’ve even lived in the armpit of California, Bakersfield for a little while. Scott: We’ve done some deals there. Oh yeah. Oh yeah. Scott: Those houses out there, man, they’re interesting. We’ve had a lot of very strange ones out that way, so. Joe: Then I lived in San Francisco as well. And I still have family live out there. It’s California is a cool place, but what a crazy market California is. And how long have you been wholesaling and doing real estate? Scott: So we’re just coming up to our fifth year end of 2019 will be our fifth year. So it’s, it’s been a roller coaster. It’s been a lot of fun. I mean for me, I started just like a lot of people that are probably listening. I mean I started hearing Sean Terry and started kind of falling as videos the Flip to Freedom program and all that and then just kind of kept going from there. But, you know, for me, I experienced this market. California it’s competitive. It’s definitely one. I’ve seen a lot of people and not succeed in and we’ve done a good job actually really kind of pushing through those barriers and finding our niche here and it’s a good market once you’re able to crack it. Joe: Sure. Good. I want to talk to you about that and ask you some questions about it. What were you doing before 2014 before you started getting into real estate? Scott: Sure. Like everybody else I had my nine to five. I had a business on the side that I ran in the cell phone industry. Did that for about a year. I just purchased phones off of Ebay and Amazon, ones that were damaged refurbed them and sold them overseas. Started doing that, got that to almost a $4 million business. But I did all that while I was working my day job and that was sitting in a cubicle and that was horrible I hated it. I hated going into work every single day. I’m sure a lot of people know the feeling of that. Just I said, this is not for me. Scott: And for me I looked at it and said, I don’t think I’m somebody that’s employable. I don’t like taking direction from people I don’t like I don’t like waiting for people to approve something I want to be the person that approves it. I want to be the person that gives direction. And finally I just, I said to my wife and my, I can’t do this anymore. I said, we need to do something else. And the cell phone business was a little boring. It was very tedious. So at that point I basically just said, we need to find something different to do. Scott: And we, I don’t even know how we came across a Sean Terry video. He popped up and I’m like, who is this guy? He is just, this guy is on something good, good guy he got me hooked and I started watching his videos and that’s how we kind of found wholesaling and I’m like, you know what, let’s give this a shot. What do we have to lose at this point? So I love real estate and I was considering being a real estate agent and my wife and I bought a couple houses, flipped them, just went to the auctions like everybody else and said, okay, I’ll bid this, I’ll bid this. And just kept going. And luckily we didn’t lose on any of those houses, but we said, you know, it’s a pain to go sit there and fight every day to try to get a house. Scott: So that’s how we started saying we’ve got to do something different. So we started following Sean’s program with the intention of not wholesaling with the intention of getting all the houses and fix and flipping them, but we cracked the code on getting the leads in and the leads were coming in faster than we can even do, and we didn’t have enough money to buy all these houses. So basically I just said, hey, let’s look at this wholesale thing that we saw and see how this works. And man, we took off from that pretty darn quickly. We had our first employee on and three months, so. Joe: Really? This was 2014. Joe: Cool. 2014 wasn’t as competitive as it is now, but it was still competitive back then, wasn’t it? Scott: It’s definitely competitive. I mean the thing about California. There’s a lot of houses there’s a lot of people. I don’t run into a lot of competition. I, I’ve met a lot of guys that are doing this in the area, usually not to the scale that I am, there’s a few of them out there, but ultimately I don’t run into the competition out there. But it’s just there’s competition with real estate agents and how hot the market is. So when you start looking at as 2015, 2016 was coming around, somebody who put a house on the market and within five days it’s got cash offers above asking. So for someone like us as a wholesaler to come in and be like, all right, we need this house and you know, $60,000 $70,000 lower than that people were offering cash, they’re bringing cash to close to be able to basically say, hey, I’ll give you 20,000 over what you’re asking if you sell me right now. Scott: $30,000, $40,000, $50,000. Of course they don’t appraise, but they’re bringing cash in. So people are almost setting himself up for the next bubble right. They’re basically saying, Hey, I’m going to overpay for my house then I’m going to pull a bunch of cash out of it and see what happens later. Joe: Do you see that happening again right now? Scott: We’ve definitely seen a market change here. Really for us, we started really noticing it around November of last year. We started seeing our buyers starting to get a little more cautious on what they were going for. So we started finding that we had to start getting our offers lower. So we had to start really justifying that. We’re starting to see that kind of fix itself a bit now of course we’re getting into that time of year where we’re starting to get spring, summertime where things are hotter. Scott: None of us know what the heck’s going to happen with the market, but I mean we just kind of take it day by day. Our goal is to get the house, get a fair offer to the seller, but also get it as low as we can so we can get the largest wholesale fee we can get. And most cases we were probably able to move about 95% of our properties if not a little bit more. But I mean things fallout for various reasons, right. And not always just buyer issues, so. Joe: What do, what are, can you give them like a simple, quick formula for how you’re making your offers in a hot market like California? Scott: Yeah, I mean, so for us, our number one thing is repeat buyers. So we always want to make sure that our buyers get a return and we work backwards from there. So if we say most of our buyers want anywhere between a 10% to 15% return depending on the area and that’s 10% to 15% return after rotor commissions, they’re closing costs, repairs, holding costs. So we basically say, okay, if they, if they want it 10% to 15% return, let’s set it at 12%. So we’re going to take that right off the top. What is their realtor commissions going to be when they go to sell it? Understanding, they’re probably getting a discounted rotor commission. So we’ll usually take out like 3% for that. Then we start working through construction. So if we’re looking at a $50000, $60,000 remodel, a, we’ll take that off and then we assume holding costs at about 1% right in there. Then we come to our wholesale fee, okay, what do we want? Do we want $100,000? Do we want $50,000 and then that comes off. Scott: So each area we work in is a little bit different because we can go out to San Bernardino county where you can buy a house for $90,000 then you can go to LA county where you buy that exact same house and it’s $400,000. So the simple, Oh, I’ll just go 70% of value doesn’t necessarily work in some of our markets out towards San Bernardino. We’re really like 60% of value if you want to look at it. But then when you start getting towards Orange County, if you find a house that has a big lot, people there have a tendency to buy the houses expanded another 2,000 square feet onto them. So you can sell them at 90% of value because they’re looking for the add on. So you just have to kind of really pay attention to what your audience is and what could potentially be done with the houses. Scott: LA huge, until you could find a property that’s zoned r two r three where you could put other units on them. We have one of those right now. If we would have wholesale, we would have made about $5,000. But we’re actually making about $95,000 in a wholesale fee because we found a buyer that wanted to add two more units onto the property. So by getting creative with things like that, that helps us bring in the additional funds. I mean our average wholesale fee is about $68,000 right now. So we want to kind of keep growing that and by doing more of these unique things, we’re able to just kind of get that higher. Joe: That’s amazing. $68,000 is your average wholesale fee. What would your average wholesale be in San Bernardino County? Scott: We’re usually sitting about $25,000 right in San Bernardino just because the housing prices are lower. We did close one that actually we just $155,000 wholesale fee and that was Riverside County, this right next to San Bernardino. So it’s still possible you just have to find the right place and find the distress and then you can, you can get that one done. Joe: With wholesale fees that big are you double closing or doing assignment fees? What are you doing there? Scott: This one in particular we did, but we had the double because there was an issue with the buyer’s lender. But 99.9% of what we do, everything’s assignments. It really comes down to how you treat your buyers and how you educate your buyers. So because we go for repeat, buyers we’ll say, hey, listen, Bob, I’m going to make $100,000 on this house that’s my wholesale fee. You know that the price, I offered it to you, the prices on the contract that was fair, right? Scott: He’ll say yes. I say okay, on the next one I might only make $10,000 and you might make $100,000. Good for you, but don’t come back to me and tell me you need it lower because of my wholesale fee. People still try, but our contract is very solid with that once they sign their end. And it also says that they have basically no ability to come back and ask for any type of price reduction for any reason. Of course, they’re going to try, you know, like the lady with the $155,000 wholesale fee, as soon as she saw that, she was just like, oh, I needed it $100,000 lower. Oh, that’s funny because the price just worked 10 minutes ago before you found this number out. Scott: And there was another wholesaler involved at another $20,000 on top of that. So it was actually $175,000 wholesale fees the deal and so she ended up closing. Uh, but I mean, of course they’re going to try to get them lowered. That’s ultimately they want to get the best return and we want to get the best return. The difference between us and a lot of those fly by night wholesalers that don’t last is because we make sure that the buyers get the return that they need so they can come back again. She might see we made $155,000. She may try to low ball us next time thinking we’re going to make $155,000 again, but usually that’s not the case. That’s more of an anomaly than the normal. Joe: You are. Let me ask you before I talk about your buyers, because that’s obviously super important. How many deals you guys averaging a month or how many deals did you guys do in the last 12 months? Scott: So in 2018 we did about 156 I believe. Don’t quote me exact, somewhere between 150 and 160 deals. Joe: Very good for you. How’s 2019 looking so far? Scott: It looks pretty good. We’re pretty far ahead. I mean January was a bit rough just because we had deals under contract and that, that bit of shift in the market, we had to go back and get some price reductions and let a few deals go, but that’s bound to happen. But we are, I mean we’re what the 2nd of April right now and for the quarter we’re already at like $190,000 in wholesale fees in the first two days, so my team just said this morning that their goal is to get $1 million quarter, this quarter. So we’ll see if they accomplish that. Joe: Very good man. I’m very impressed, Scott. Joe: I know have some southern California wholesalers that are grinding their teeth right now. How’s this guy doing that? Scott: We all do it so it’s tough. And to be honest, I mean, we all grind our teeth on things. We all have times where we’re like, what am I doing? Why am I even doing this business? And even with the amount of deals we do, we’re not perfect. We’re still learning every single day. New things are coming up every day that we have to find ways to round. And we’ve gotten very good at trying to find ways around things. But I’ll be honest, I’m not going to lie. We had like two negative months last year. So for the people that are having the problems and they’re saying, oh my gosh, I can’t lose money, right? We’re in real estate. So regardless of how you want to look at it, and you want to say we’re siding houses, however you want to look at it, we’re in the real estate industry and in real estate sometimes there’s things you can’t control. Scott: You can’t control a lien that pops up on a house and it takes you know, 30 days to find the three banks that went out of business it was sold to, to finally get to the end person. We’ve had deals diverse, supposed to be seven days and they took six months. It just, it happens. So people can’t get discouraged by a market shift because honestly, this isn’t even the big one this is a very small market shirt right now. So for us, just keep pushing forward, focus on that next deal. And you’ve got to look at every deal, but starting to fall apart and say, all right, how much am I making and is this worth it for the amount of time I’m going to have to put into it, right? If I’m going to make a $100,000, I’m going to put every month, but every waking minute I can into it. Scott: But if we’re making $5,000 on a deal, and I’m like, all right, in labor, I’m going to have to pay my team $2,000 I’m going to have to spend all this money. Is that worth it or should I just drop that and focus on the next one? So it comes down to making those tough decisions sometimes, but there’s a lot of people that are killing it in this market, there really are. And even out towards San Francisco, I know a lot of guys up there and that market’s very competitive as well. Jason Boozy out there, I don’t know if you know, he is, I mean, he’s doing probably five, six deals a year, but each of his deals are more than two months of my income because he does such unique deals. So there’s ways to do things. There’s a lot of people succeeding in California. I just don’t want people to get discouraged based on a bad month or having trouble finding deals. Joe: I want to get Jason on my podcast. I’ve been trying to, and we almost connected one time and then something happened and okay, cool. So talking about buyers and obviously buyers are super important. Are you focusing a lot of, what percent of your marketing are you focused on trying to find good buyers? Scott: So buyers in the past, the way we always looked at our business was acquisitions was like 95% of our business and buyers was like 5%. Then we realized how stupid we were thinking that because getting a buyer just as important as getting a contract because there’s really two sides. So we had to start looking at it on an even scale. So 50% of our time spent for acquisitions, 50% of our time spent for buyers. But when it comes to dollar value, we’re spending, buyers are more word of mouth than sellers. So we may spend maybe $300 bucks a month looking for buyers if we want to put a campaign out there. Maybe not even that, but for sellers, we’re spending, you know, $40,000 $50,000. So that’s the difference in that. We spend a lot of the time just kind of communicating with people. So we’ll go ahead and try to ask our title company for cash transactions when we get that we’ll run it through a skip trace company, a lot are LLCs. So in that case we expect it to be like a 10% hit rate. I mean, very low, but that’s 10% we don’t have to look for. Scott: Then we start running through in spare time, start running through corporate documents. Most of the time there’s addresses. So we’ll just send out a, Hey, I’m Scott, I’m with SJO Investments. I’m out here to basically give you, make you some money, right? So we’re not sending the, hey, I’m a wholesaler. I’ve done three deals in the past two months. I have a deal on 123 Main Street. We don’t do that. If you want to make money, you want to work with us. We’re very blunt and very to the point. And we just put a phone number on there, call braille so we can track everything coming in and usually our phone will blow up pretty quickly once those come in. But the bigger companies, obviously the letters don’t always work with, they get in the garbage as fast as they arrive. So those ones are a little more creative. Scott: You have to go and just start showing up at their lobby and saying, Hey, I’m here. Oh, he’s not available, okay, great. I’ll sit here. I’ll be here for hours. I mean, we’ve tried it and it works. But once people start learning your company, people start coming to you. So we have more buyers that are just showing up at our doorstep type of thing than we have in the past because the word’s getting around that we’re taking care of our buyers and we’re not leaving them, you know, 50 cents on the backend after they spend $5,000, we’re making sure they actually make money. A lot of them shifted over to using flat listing services. So by using that, we’re still a building in the realtor commissions for them, right? So now they’re probably making 18%, 20% on their return and they’re loving it. So they call us, hey, when’s the next house? When’s the next house? And I mean, if I looked at my board right now, I probably have maybe five, six buyers on that board that are buying all those properties. Scott: Just because everyone always says (inaudible) I mean I’d rather have 20 people on my buyers list and they’re all performing versus having 10,000 people on my buyers list building all those emails for people that are tire kickers. So that’s where I differentiate from like, people that are out there, you know, even I think Sean, definitely someone that says, Hey, get your buyers list bigger get it bigger, for me, I’m like, just give me some quality people. That’s all I want to see. So that’s our focus. That’s exactly it. And you know, for us, we’ll take a couple of our buyers. We have the NIMH baseball team, every once in a while some of our big buyers were in a suite there. Ones that won’t have issues co-mingling and get those guys together, throw some source of beer stuffing the sweets some food. Scott: Just bring my sales team and make sure they know my TC. Just introduce them and just wine and dive in those guys. And while we’re there we’re always saying, hey, you know, that last property you had to make at least $80,000 on, I saw you sold it for over market. Well, I got this other one, I kind of need your help on this one. I know it’s going to be a little bit tighter, but you know, hey, will you buy it? If not here, have another beer glasses. Let’s keep going. I got the contract right here. And it actually works. People like the wine and dine attitude and we don’t do a ton of that. But some of those people that are really beneficial to our business, we take care of them. You know, I got a steak dinner planned next week with another buyer. Scott: You know, another guy requested a bottle of blue label. He’s getting his bottle of blue label. Because he said, hey, I’ll buy this house but give me a bottle of blue label. I’m like it’s a $80,000 wholesale fee and a bottles like $150 bucks I’ll buy you two. So I’m kind of a little bit of the fun bribe stuff, but all in good fun. Joe: Really good. Let’s talk about marketing, marketing for sellers and how much are you spending a month on marketing right now, your budget? Scott: We’re about $45,000, between $40,000 and $45,000 depending on the month. Joe: Okay, very nice. And now I’m just looking at the numbers. $40,000 to $45,000 and if you’re averaging, let’s say last year you did 156 deals, that’s 13 deals on average a month, okay. You’re spending about $3,500 in marketing per deal. Does that sound about right? Scott: Yeah, it shifts a little bit. We were doing a very heavy PPC last year and because of a lot of stuff, Google was doing, our PPC kind of shifted and went kind of downhill for a while, so our costs went pretty far up and now we’re driving that back down. So that’s fair to assume at this point. But this year we’re, you know, our goal is to get that somewhere down around like $2,000. Joe: When you first got started, you remember what it was back then? Scott: Oh Gosh. I took, we were like, oh geez. Probably almost like $5,800. We, I think we hit as high as $7,000 at one point. And part of that was, this is because I was out there doing the acquisitions and for me, I just don’t have the patience for that role. I knew I had to fill it. So when I’m in Corona and I get someone that says, Hey, I want to sell my house, and they’re in LA, I hop on the road. And if you’ve ever sat in traffic here, it’s not fun, right? So it could take me an hour and 45 minutes two hours to get there. You’re already pissed off when you were having the seller’s house. And then when that seller tells, you no, you’re like, man, I got a two hour drive home right now. I drove two hours here and now you’re telling me no, come on, you just want to like, oh. So that was not my role. So I tried to fill that one pretty quickly and I knew I was driving our costs up because I just wasn’t locking the contracts up like, like somebody else would be able to do. So now that’s under control. Joe: What kind of marketing are you doing? That’s working right now? Scott: So we are doing mainly male right now. We stopped RVM a while back just cause I kind of worry about the legalities and some of that stuff. It just wasn’t worth it. So we cut off RVM’s probably about six months back. So mail is a big one for us right now. As a lot of people have shifted towards RVM, you know, they’re running after the next golden nugget that’s out there. I kind of hold back because everyone says mail doesn’t work well. They’re all running after the next thing and they’re just dropping the mail. And I say, you know what? That’s fine all you guys leave mail. And then I’m going to be one out of three postcards instead of one out of 50 postcards that are arriving in a mailbox. So we keep a very simple process. I send one postcard, I never change it up, never send a letter and ultimately we just send it over and over and over. We do some texting as well. There’s a system out there called Lead Sherpa. Well it’s the masses now. It’s out there. Joe: It is amazing. It is amazing. Jason Nichols really cool guy. And yeah, so talk about Lead Sherpa. Is that, how’s that working for you? Joe: 5,000 texts a day? Scott: 5,000 of them, yeah. Joe: We just had a client he sent about 150 text messages and was complaining a little bit about, I’m not getting any leads from it. And I thought, yeah, 150, what that like, you need to think bigger, you should be sent. And this is over a three or four day period. I thought, you know, you just don’t get it yet, but that’s all right. We’ll work with that. We’ll work with you. So that’s a lot of text messages a day. So can I ask you who you sending the texts too? Scott: So for us, we, every single list we pull every single way possible. So we don’t complicate this system. We say if we all your ownership list, we’re going to hit those people through texts, we’re going to hit them through mail, we’re going to hit them through cold calling, we’re going to try to hit them every way we possibly can to make sure that they know who the heck we are. Joe: So you’re marketing combination right now of let’s get all the lists that we can, and it’s a pretty simple list, I think you’re saying, right. It just, they need to have owned it for a certain number of years, right? Scott: Yeah, we do a 20 year lists. We also do the standard bacon lists. We’ll pull trustee sales. We focus a lot on elderly. So, I mean if we look at somebody that’s over 65, but they have a two story house, that’s who we try to hit as well just because it’s an important list. It shows, hey, they’re getting older, they’re going to start putting in that ramp up the stairs or they’re going to sell the house to move to a single family. So we try to be a little bit picky on what we’re sending just to try to find what the distress could be. And if we find that distress, we mail it. We don’t go pull like divorced list and mail, things like that because most of those people are in the other list we’re pulling anyway. So we just go ahead and take it, we’ll list stack it a little bit and then and send it out. Joe: I’ll have to talk with you. We’re testing something new right now and I know if I should be talking about it, but we’re testing something new right now with the Facebook Bot that actually goes out and finds the buy sell trade groups like, you know, garage sale groups or any of those groups that sell on Facebook that sell stuff. And we’re just putting very non spammy, these bots are putting very non spammy messages in these groups. And then it’s handling any response that comes in or any response that if it gets a comment, the Bot will send a quick reply and we’re getting these people on to Messenger and we’re getting from Messenger we’re getting them on the phone and working pretty crazy right now. Joe: And so we’re again just barely testing it. Somebody contacted me about it. I’m testing it right now in a couple markets in Nebraska, believe it or not. And it’ll be interesting to see if that works. I’m always looking for new types of marketing. But you know, at the same time what worked when I got started in 2006 and 2007, you know, direct mail, it’s still working today. I’ve seen it go through cycles where like people are saying oh that doesn’t work anymore. Well yeah it does. It really does, right. And just getting them the old fashioned phone, it was still at work. Scott: That’s 100% it people think you need that new stuff every single time. Which the new stuff is great. Like I said that text works for us. But that’s the thing is people think that just because they switch to something new, you know, you don’t just do one marketing channel. I hate the all your eggs in one basket mentality. Now I use the same lists but I hit everything. Why not? You already paid for the data you paid for the data use it every way possible. Get it in front of as many people as possible and close the deals. Because if you don’t, you’re competing with someone like us who’s doing that. We’re going to get in front of that seller most likely faster because we’re hitting them every way possible. Or we piss the seller off, I mean it could go either way. But I mean in most cases they’re respectful because they’re not getting the cold call on the same day they’re getting the text and the mail on the same day they’re getting both those things. Yeah, it’s spread out. So most of the time sellers are pretty receptive. Joe: People are probably wondering what that software was again, it’s called Lead Sherpa, Lead Sherpa, Jason Nichols, friend mutual friend of ours doing really, really well with that. So if you want some more information, go check it out and tell Jason that Joe and Scott sent you just so were sending him some love. It’s pretty cool. It’s pretty amazing how he does it and it’s compliant and we won’t go into all the details of that, but it’s a really good system. Scott, talk a little bit about your team. What is your team now? Do you have, do you actually with your acquisition guys, how many do you have? How many dispositions? And all that, but like are you going to the houses? Are you still doing appointments? Scott: We go to them when we find that the seller might want more of the belly to belly conversation. We started closing a lot more over the phone, but I’ll be honest, I mean our largest spreads are in person, so the $155,000, we just had them and one of my sales guys is hitting multiple spreads over six figures. It’s just a regular thing for him. And those six figure spreads except for one if I’m correct, is all face to face. Joe: So how many position guys do you have? How many dispositions you guys do and what else do you do? Who else do you have? Scott: Okay. So three acquisitions. Those are the guys that will actually go out to the appointments or do the phone appointments. We have one inside sales that’s our guy that texts all day, one dispositions to cover all three of them. That’s getting to the point it’s getting a little bit heavy of a workload. So eventually we might bring on another starter dispositions person to kind of just build relationships. We have a transaction coordinator, so we’re an escrow state, so versus a lot of you guys that are lucky just to be lawyer states. We have to run through escrow. So I have a transaction coordinator in the office that helps coordinate all that stuff with escrow. We have basically a full time in the office, someone that answers all of our phone calls so our lead manager. And then we have a VA in the Philippines and answers evenings and weekends. Scott: Then a couple other businesses I have, we have a few other people in the office, those things as well. But as far as the investment side, that’s where we sit. So not a huge team. I mean, ultimately this is a business, it can be brand very lean We have everybody incentivized on commission. So it’s not a huge overhead for us. Kind of keep that a little bit lower. But we worked very hard to get to where we are now with our team, our acquisitions team. I mean put them up against anyone I’d be shocked if they didn’t win. Probably lower as well. They do a good job just really negotiating with people and really building that rapport. Scott: And you know, you see so many people go out there and they meet with a seller and they walk in the house, Hey, I’m Scott. Oh, anyways, I’m going to have to replace this kitchen. I’m going to need to do the paint. It’s just, we don’t even talk about that, you know, for us, you’d be there an hour and next thing you know, you’ve just talked about their grandkids and what they’re doing, where they’re going next and it’s the rapport building. That’s what we do so well as a company and so many people, it’s so simple, but they miss the boat. I mean, sales isn’t going out and throwing your product in someone’s face, right? Acquisitions isn’t doing that. It’s really going out and throwing you in their face and saying, Hey, talk to me I like you like me, let’s talk. And once you get that down, it’s big. And I probably shouldn’t be sharing all that because now you all of you guys are going to start doing it. Joe: It’s good. I mean like I think that it is common knowledge, but do you work pretty hard diligently on training your sales team, your acquisition guys, or do you have somebody that manages your sales team for you? Scott: So I’m pretty much disconnected from my business. I mean I come into the office and do some other stuff I have, but I have my sales manager’s is also my COO, so he actually trains all of my sales team. My sales teams also been through John Martinez sales training as well so they’ve done things like that. But we have our meetings every single week as a team on Tuesday morning. And then when the meeting with everybody ends, we have a sales meeting for about 45 minutes and we go through every single deal, every single loss deal, gain deal, what could we do better, any issues with sellers. And we help as a team collaborate on how we can get better at these things. Scott: So we do it weekly. And then occasionally we do like, you know, work in then take my sales team out, grab a drink, and we just sit in a very relaxed environment and just say, hey guys, tell us what you need from us. What can we do better for you? Because if a sales person is not performing, number one, either he isn’t, he doesn’t care, he’s not driven by commission or number two, it’s something that I’m not providing that person and we’ve got to find out what it is. Joe: Yeah. Okay. How’d you find your COO? Scott: So he started out as an acquisitions person with me and when I hired him I actually tried, this is the first guy I’ve actually recruited. I tried to get him and tried to get him and finally he sat down with me, probably a year after I started saying, you need to be working here. You’re making $60,000, $70,000 a year right now. You can be making two or $300,000 a year with this. And finally sat down with me and he said to me, he said, hey, he was interviewing me more than I was interviewing him. He’s like, where’s your company going in five years? Where do you want to be in five years? I’m like, whose interview is this? But ultimately he, he interviewed the heck out of me and he had so much, but I said to him, I turned around, I said, where are you going to be in five years? And he said, I’m going to be running your business. He said, but I wouldn’t put five years. He said, I’d put three. And I said, wow, okay. Scott: So he’s two years into the business right now. And he has my COO role, makes all the decisions for the business. I’m here because I want to be for other ventures I’m doing, but I don’t have to be in my real estate business day to day he runs it. I trust them wholeheartedly. He makes great money. He’s very happy. Him and I talk all the time, we’re great friends now, but we’re also, you know, we know when it’s business and when it’s friendship. And I think my business does a damn good job because of some of the stuff and some of the decisions he’s made. And you know, for me, we promote from within. I don’t hire anybody outside if I can find somebody in my company that can be promoted. Scott: Because there’s nothing worse for a team environment to literally bring in somebody new end to be their boss. It’s tough saying, hey, here’s this new person. You weren’t good enough so I went ahead and brought in somebody else to do it and I hate that. So we promote from within every, every chance we get. Joe: That’s good. Really good. I want to ask you a few more questions about some of your systems and tools that you’re using. What are you using for CRM? Scott: We use Investor PO for our Podio system. So we upgraded that probably about a year ago. They do a damn good job for us. Basically it’s very automated and that’s what we were shooting for. So Investor PO does good. And then we just use Call Rail for all of our call systems. Joe: Okay, good. Do you mind talking about where you see yourself going in the next three to five years in? And if you don’t mind talking, what are some of these other business ventures that you’re doing? I’m just curious. Scott: Sure. So I mean definitely this year we’re going to grow the business. I mean our goal is to hit over $4 million in wholesale fees within this business. Um, and we’re going to go ahead and start expanding outside of California. So that’s going to be our goal by the end of this year, just kind of narrowing down our markets. For the other things we have going I have if you’ve heard of Max Maxwell, he’s my business partner in a mastermind we just launched. So him and I launched a Wholesale and Elite Mastermind. I also have Lead Gen Pros, that’s a cold calling company that I partnered with Jaylen White and Max Maxwell on. So we’ve got that both pretty new companies. Those are kind of our new ventures. We’re really kind of just starting slow. But I have a skip trace lists as well. So we have a skip trace company for us, our goal is to have multiple avenues. Scott: I mean we look for businesses that help my business and then we just start offering them to other people. So I mean me starting to skip trace company had absolutely nothing to do with the thousand other people starting to skip trace companies. I just wanted to have control over my data and I wanted to know that my data is safe. So I went ahead and did it and they’re like, oh, you got to run like a hundred thousand records a month. I’m like, alright, you know, I can just advertise it to some people then. I mean, our goal is not to make it a multimillion dollar company for that. I have it for my own use and if people want to use it, they can use it. So, but yeah, those are, those are my three focuses right now because the skiptrace company about six months old, the mastermind, we just started selling at Max Maxwell was event a week ago. So we’ve got quite a few members on that. Joe: How’d that event go? Scott: That event was great. I mean, there was almost 1,200 people in that room and everyone was so hungry to learn and it was so, so excited because one of the things that Max always tells me is we don’t sell from the stage. And a lot of those events, they sell, sell, sell, sell from the stage. And it’s refreshing because people don’t feel like, Oh God, here they go again they’re going to sell this or they’re going to sell that. We can tell them systems we’re using Max and I talked about our mastermind, but for us, the mastermind, we don’t want to force anybody into it because we want people to want to be in it. We want to help people get to a multimillion dollar business, but we don’t want to have someone put money out and then say, what did I do right? This isn’t for me. Scott: That’s, we don’t want that. And so I like that about the way he does his events and there were some really good people there, a lot of good info. But it’s, and it was, it was refreshing to be there up there on that stage with 1,200 people. It was, it’s exciting, I get a rush from that. And for me, I’m like, all right, put me up here more. Let’s get up here and let’s just, let’s show people what we do so well. And especially let’s show the people that keep saying, I can’t, right. I can’t do this, I don’t know how to do this. Then come to one of these events and listen, and you grab a notepad and you just start writing. I want you to have 20 pages by the time you’re done. Scott: And when you go home, don’t put that in a drawer. Keep it out. Do it. Like you can pay for a 50 events a year if you want. There’s enough of them out there. But if you go home, you don’t actually do something with that information and take action. You’re not going to be any farther than where you were at this event. When you pay $500 for the next one. It’s sad to see that happen. You know, not everyone’s going to be a go getter, but I hate seeing people fail because of their own doing, when they didn’t want to take action on something. And you know, all the excuses we hear, I don’t have money then drive for dollars, right? Get out there and drive for dollars, knock on doors. The money aspect of it, I understand it’s easier with it, but there are ways to do it without. So I think there’s, this world is full of excuses, right? Scott: So let’s find out how to get past those excuses and not have them be roadblocks to us and get out there and be a multimillionaire or something. I mean, get out there and do it. If that’s your goal, don’t stop. Do it. Joe: My last question for you is was going to going to be, what kind of advice would you give to beginners? And I think he just gave it right there. It’s really simple and it needs to be said. Scott: Yeah. The only other thing I’ll throw out is when you start actually making money, don’t get some high end car, open the doors and lean on the other. Like a lot of these people are doing these days. Be humble with your money, right? It’s so important. I mean, I make great money, but you’re not going to see me leaning on the hood of a car in a suit showing my watch, right. I got an Apple watch to, don’t do that stuff. Just get there and do your thing. Joe: I’m so glad you said that. Now I have a real, I have a real beef with that bothers me to no end because I know what’s going to happen to those guys, right. In two or three years from now, they’re going to be hurting, you just cannot support that kind of a lifestyle with this business, it changes, you need to be humble and man it comes around. And anyway, I won’t get started I won’t go there. But anyway, that’s why I wanted you on the show, Scott, and not some of those other guys. But, you know, for whatever, whatever it’s worth. I’ve been in this business long enough to know Scott, somebody who’s really doing well and somebody who says they’re doing well and usually it’s, I don’t want to go there because I don’t want to cause any controversy. Scott: I know what your getting at. There’s a lot that goes on underneath this cover and all that they don’t want you to know about. . Anyway, you were really gracious with your time, Scott. I’m going to actually text Max. We were communicating, um, a month or two months ago and he’d just got super busy and I got busy and I’ve been trying to get him on my show. So I’m going to text him here in a minute. Will you do me a favor and text him about 10 minutes from now? So he gets two texts. Hey, get on Joe’s podcast, would ya? Scott: It’s going to take more than that with him. He’s a hard guy to pin down. But, I know even a few guys I know that are like, Hey, I’ve called Max like 10 times. I’m like, well I’ll try, I’ll help you out how I can. So I’ll definitely do that I’ll do it. Why the heck not? Joe: I’ll text him again. We spoke together at a Tom Crowl wholesaling event in Asheville, North Carolina five, six months ago. Super nice guy. And I’m glad to see you’re working with him because he really does keep it low. He’s not the flashy guy that’s, you know, trying to impress everybody. Scott: Yeah, that’s exactly it. That’s what impresses me about him. He’s a good guy and it’s hard to find that sometimes in the industry. Even some of those flashy guys out there. I mean some of those guys truly are making great money. I can name a few. I mean they’re doing good and they may like their nice things, fantastic, it’s their way, not my way, but I respect them because they are out there killing it. You know, max is one of those guys where I look and say, man, this guy, he’s a genuine guy. He, you know, he actually cares when he puts these events on me. He lost over $100,000 on the houses that he bet on, you know, probably kill me for saying it. But I mean, he did that because for him, he’s like, Hey, I’ve got to do this. There were some issues that came up and he’s like, I got to put this event on because I’m doing it for these people and he still did it. So that’s not a humble guy. I mean, what else is, so I highly respect him. Joe: It’ll come back. It’ll come back to him. Cool. Well, how can people get ahold of you? You know, maybe somebody, wants to invest some money with you. Maybe somebody wants to buy, be one of your buyers. Maybe somebody has some questions about this mastermind. You have a good place for people to go, Scott? Scott: Okay thank you so much. Joe: Okay, we’ll see you. Joe: All right. Hey guys, real quick, don’t forget go to RealEstateInvestingMastery.com RealEstateInvestingMastery.com to get the show notes to get the links to the things that we talked about on this show. And we’ll put all of that, we even have a transcription of this podcast. So if you can’t, if you had too much or too many audio problems and you couldn’t hear what was going on, we have a transcript. So we have a way to, you have super magic ninja powers to turn that stuff into a transcript that at least reads and makes sense. So go to RealEstateInvestingMastery.com and look for the episode. You can go to the search bar and do a search for Scott. And you’ll find our interview with Scott here and I appreciate it. We’ll see you guys later. Bye Bye.